The Sports Kolache: MITCHELL REPORT-PALOOZA!! Wow, what a day. Who would've thought the Mitchell Report would provide so much fun. 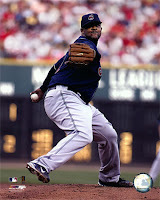 We were first treated to a rousing morning of rumors and innuendo of whom would be on the list (Albert Pujols, anyone? ), followed by George Mitchell's press conference (recommended viewing for any insomniacs out there), and then the treat of reading the report itself where the jaw dropping description of Brian McNamee injecting Roger Clemens buttocks full of juice was enough to subdue the anger that my Alex Rodriguez-Johnny Damon steroid exacta ticket was not going to cash in on this fateful day. 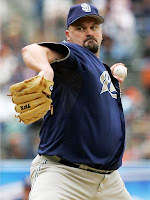 In the end, I'm glad that the vultures can finally leave David Wells and C.C. Sabathia alone and know that their bodies are the result of hard work, and the only chemical that they've ingested is Yellow Dye #5 (found in Twinkies). Rock on, big men! For those of you looking for some time to kill, the Mitchell Report itself is some of the best reading I've come across in quite sometime, complete with images of canceled checks and Fedex tracking slips. So f-ing sweet! And finally, Bud Selig's reaction to the report. Justice will be served, cheaters -- SELIG STYLE!! Somebody go wake up the Gimp. Baseball players are taking steroids?? I had no clue? I wanted to post the REM song "Exhuming McCarthy", but I couldn't find a video of it. Can anybody please explain to me how a Ex-US Senator can publish a report that can threaten a witness with jail time if they don't cooperate?, and he has the power to release a list of names accusing others of a crime without them even getting to refute it in a court of law? We all know that baseball was invaded by the juice. I am not saying that at all, it is obvious. My point is that throwing out a bunch of heresay and rumors is not the way to solve the problem. At least McCarthy was a sitting Senator when he went on his obsession, many innocent people are going to have their names smeared by the Mitchell report.